Prof. Kanbur served as one of the chairs of the International Panel on Social Progress (IPSP). IPSP is uniting the world’s leading researchers from social sciences and the humanities in a single effort: Developing research-based, multi-disciplinary, non-partisan, action-driven solutions to the most pressing challenges of our time. His lecture will report on the findings. 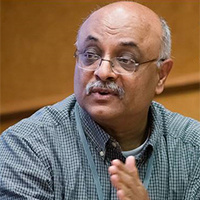 Prof. Ravi Kanbur is the T. H. Lee Professor of World Affairs at Cornell University’s College of Business. He is well known for his role in policy analysis and engagement in international development. He has served on the senior staff of the World Bank including as Chief Economist for Africa. He is also ranked in the top 0.5% of academic economists in the world. The Voices seminar series provides an interdisciplinary forum to advance ideas and environmental policies for a sustainable and equitable future.